This protocol describes the isolation and dissociation of mouse medulloblastoma tissue, and subsequent allografting of the tumor cells into immunocompromised recipient mice in order to initiate secondary medulloblastoma. Huang, X., Sarangi, A., Ketova, T., Litingtung, Y., Cooper, M. K., Chiang, C. Intracranial Orthotopic Allografting of Medulloblastoma Cells in Immunocompromised Mice. J. Vis. Exp. (44), e2153, doi:10.3791/2153 (2010). Medulloblastoma is the most common pediatric tumor of the nervous system. A large body of animal studies has focused on cerebellar granule neuron precursors (CGNPs) as the cell-of-origin for medulloblastoma1-4. However, the diverse clinical presentations of medulloblastoma subtypes in human patients (nodular, desmoplastic, classical and large cell/anaplastic), and the fact that medulloblastoma is found in a subset of human patients with no ectopic expression of CGNP marker5, suggest that the cellular and molecular origins of medulloblastoma are more complex and far from being completely deciphered. Therefore, it is essential to determine whether there is an alternative medulloblastoma tumor cell-of-origin based on which cell-type specific therapeutic modality can be developed. To this end, intracranial orthotopic allografting of genetically marked tumor cell types followed by subsequent analyses of secondary tumor development in recipients will allow determination of the cellular origin of tumor-initiating cells. Here we describe the experimental protocol for intracranial orthotopic allografting of medulloblastoma cells derived from primary tumor tissue, and this procedure can also be used for transplanting cells from established cell lines. Sick mice bearing medulloblastoma are often runted, and display hydrocephaly and typical neurological symptoms, including posterior paralysis and failure to regain posture when overturned. To retrieve tumor tissue, euthanize mice by carbon dioxide inhalation. It is imporant not to perform cervical dislocation, a procedure that generates pressure to the posterior skull and can compromise tumor tissue integrity. Decapitation is performed immediately after death using a pair of scissors, removing hair and muscle tissue as much as possible for good visualization of the skull. Clean the surface of the skull with Kimwipe soaked with 95% ethanol. Use fine scissors to cut an opening along the midline of the skull, and remove skull tissue using fine tweezers, at which point the whole brain including tumor-bearing cerebellum is exposed. While the cerebella of healthy adults display well-defined hemispheres and vermis, the cerebella of tumor-bearing mice are often enlarged, amorphous with a smooth surface and conspicuous blood vessels. Using sterile techniques, retrieve the cerebellar tumor using tweezers and place in ice-cold phosphate buffered saline (PBS) without Mg2+ and Ca2+. Note: all instruments are disinfected in 95% ethanol and steam autoclaved before use. Transfer the tumor tissue from PBS to 50% Accutase (diluted in PBS) that is about 4 times the volume of the tumor tissue, mince the tissue with fine scissors for 3 minutes at room temperature, followed by incubation at 37°C for 4 minutes, after which the tissue undergoes repetitive pipeting with a 1-mL Pipetman for an additional 3 minutes. This method should yield a mixture of single cells and small cellular aggregates. Resuspend the cell pellet in freshly prepared neural stem cell medium consisting of Neurobasal medium with glutamine, Penicillin-Streptomycin, N2, B27, human EGF (25 ng/mL) and basic FGF (25 ng/mL). Calculate the cell density of the solution and make appropriate further dilutions with additional neural stem cell medium such that one can load 4 μL of solution with an appropriate number of dissociated tumor cells, e.g. 5x105, into a sterile bevel-tipped 10μL syringe. The exact number of cells to be inoculated should be determined by the researcher according to specific experimental requirements. Keep the cell solution in a mini 200μL microcentrifuge tube (PCR tube) on ice. For the surgical procedure, a disinfected area dedicated to rodent surgery is needed for the duration of the procedure. Ideally, set up a long bench with separate but adjoining areas for animal preparation, operating field and animal recovery. Surgical gloves, not exam gloves, are required for the surgery. Aseptic technique is maintained by holding gloved hands above the waist and used only to handle sterile objects from a dry sterile surface. A mixture of ketamine (100 mg ketamine per 1 kg of mouse weight) and xylazine (10 mg xylazine per 1 kg of mouse weight) is used for anesthesia. Administer the anesthetics intraperitoneally. It generally takes 3-5 minutes for the anesthetics to take full effect. Determine whether a mouse is fully anesthetized by toe/tail pinch. Place a small amount of ophthalmic ointment on the eyes of the mouse. Bring the fully anesthetized mouse to the operating area, constantly monitoring to make sure that the mouse is breathing normally. Shave the dorsal posterior head region of the mouse, using a hair clipper, to reveal the posterior skull above the midbrain and cerebellum. Apply Betadine solution on the exposed scalp using a cotton tip applicator, followed by wiping with an alcohol pad. Repeat these two sterilizing steps two times. Make a quarter-inch incision in the posterior scalp using a sterilized scalpel. Drill a 0.5 mm burr hole 2 mm to the right and 2 mm posterior to the lambda using a sterile dental drill. Place the mouse onto a stereotactic frame by hooking its incisors onto the frame hold. Carefully descend and position the bevel-tipped 10 μL syringe loaded with 4 μL of tumor cell solution into the burr hole. Once the bevel of the syringe needle is below the skull surface, descend for another 3 mm and then ascend for 0.5 mm. Slowly inject the desired amount of tumor cells, with a steady force in a 30 second time frame, into the cerebellum of the recipient. Leave the needle in its place after completion of injection for an additional two minutes. Then remove the needle and syringe. Clip the wound using an autoclip. Keep the mouse on a warming blanket after the surgery to help maintain its body temperature. Mobility and respiratory patterns will be observed continuously. Once the mouse recovers from anesthesia, place it back in a sterile housing cage. Monitor daily for food and water intake, behavior, grooming, and red staining of the eyes. Inspect for signs of infection at the incision site. Remove the autoclips on day 7 post surgery. Maintain the mice for an average of 2-6 months and sacrifice those displaying typical medulloblastoma symptoms for further studies. Secondary medulloblastomas developed in recipient mice highly resembled those of the primary tumors. The cerebella bearing secondary tumors were often enlarged, amorphous with ectopic blood vessels apparent when viewed as whole-mounts. Immunohistochemical analyses of the secondary tumor tissue revealed that the tumor cells are highly proliferative, express strong SmoM2-YFP and markers of cerebellar granule neuron precursors, such as Math1 and Pax6. When dissociated and cultured using reported methods ("Isolation, enrichment and maintenance of medulloblastoma stem cells", JoVE in press), the secondary medulloblastoma tumor cells can be expanded rapidly, express multiple stem cell markers, are clonogenic and can further initiate tumor formation when transplanted into additional immunocompromised recipients. A typical example of secondary medulloblastoma tissue developed 26 days after injection of 5x105 primary tumor cells. 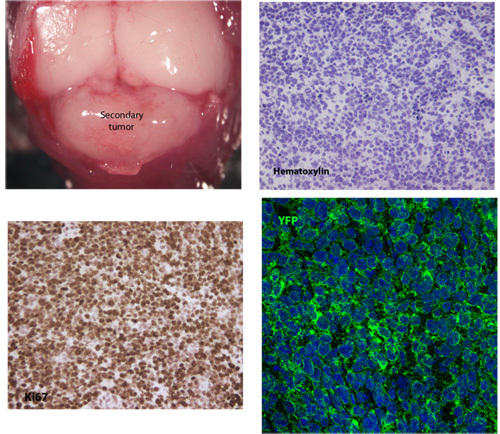 Hematoxylin staining reveals the typical cellular morphology of medulloblastoma, including high nuclear/cytoplasmic ratio and nuclear polymorphism. These secondary tumor cells are highly proliferative as indicated by Ki67 expression and they also robustly express membranous SmoM2-YFP. Using the protocol described for primary mouse medulloblastoma cells ("Isolation, enrichment and maintenance of medulloblastoma stem cells", JoVE in press), these secondary medulloblastoma cells can be cultured and expanded for multiple passages. The picture shows the same representative tumor colony cultured at 4 days and 14 days. The cultured tumor cells are bipolar, elongated with scant cytoplasm and often radiate from a dense core of cellular aggregate. They do not exhibit growth contact inhibition. The small round cells are red blood cells. Several critical factors to ensure successful medulloblastoma cell allografting that yields secondary tumor formation are as follows: First, use only 50% Accutase for tissue dissociation and do not over-digest the tissue as prolonged enzyme treatment leads to significant reduction in cell viability. Also use only the 1 mL size Pipetman as smaller tips can also generate physical damage to the dissociated cells. It is fine to have a mixture of single cells and small aggregates for allografting. Second, mix and equilibrate the tumor cell solution each time before loading the Hamilton syringe. Do not use more than 4 μL for each injection as a larger volume would generate too much intracranial pressure and resistance. Last, it is important to wait an additional 2 minutes to let the injected solution dissipate into the cerebellar tissue after each injection. The procedures described here allow for the determination of genetically marked cell type(s) that can initiate and propagate tumors. This protocol also applies to situations where the cells to be injected are not derived directly from primary tumor tissue, but from established cultured cell lines. One can prepare the appropriate number of cells by either enzyme digestion and/or repetitive pipetting, and start from Step 2 of this protocol. Therefore, we can also test the functions of candidate genes and the inhibitory effect of chemical compounds with an in vivo tumor-growth readout. This study was supported by grants from the Vanderbilt-Ingram Cancer Center Support Grant (P30 CA068485), the Childhood Brain Tumor Foundation and the National Institutes of Health (NS042205). Schuller, U. Acquisition of granule neuron precursor identity is a critical determinant of progenitor cell competence to form Shh-induced medulloblastoma. Cancer Cell. 14, 123-134 (2008). Yang, Z. J. Medulloblastoma can be initiated by deletion of Patched in lineage-restricted progenitors or stem cells. Cancer Cell. 14, 135-145 (2008). Kessler, J. D. N-myc alters the fate of preneoplastic cells in a mouse model of medulloblastoma. Genes Dev. 23, 157-170 (2009). Flora, A., Klisch, T. J., Schuster, G., Zoghbi, H. Y., Y, H. Deletion of Atoh1 disrupts Sonic Hedgehog signaling in the developing cerebellum and prevents medulloblastoma. Science. 326, 1424-1427 (2009). Salsano, E. Expression of the neurogenic basic helix-loop-helix transcription factor NEUROG1 identifies a subgroup of medulloblastomas not expressing ATOH1. Neuro Oncol. 9, 298-307 (2007).